As busy schedules cut into the food preparation time of families with active teenagers, takeout pizzas and Pop-Tart breakfasts become the norm. But Pop-Tarts fall pretty short in the nutrition category. Fresh fruit smoothies, yogurt parfaits, homemade granola, and breakfast sandwiches all provide a better start to the day, but how to fit more nutritious choices into hectic daily routines? Author Kathleen Cannata Hanna responds to the challenge of keeping teenagers healthy, fit, and full with 300 economical recipes that are both easy to make and fun to eat. She offers 15-minute dinners and satisfying pastas for the busiest evenings and 30-minute dinners and family suppers for slightly more relaxed weeknights and weekends. Hanna knows that feeding teenagers involves more than serving dinnertime meals. There are grab-and-go breakfasts to be eaten on the bus, brown-bag lunches, after-school snacks, soccer game pick-me-ups, and after-dinner treats for the kids and any friends that might be in the house too. The appealing recipes in The Good-to-Go Cookbook steer teens away from junk food and toward good-for-you alternatives. Quick Quesadillas, Easy Pizza Squares, Stuffed Chicken Crescents, and Ham Pockets satisfy between-meal hunger pangs. There are soups, sandwiches, and hearty salads for lunch and Baked Pasta with Peas and Cheese, BLT Pie, Tortilla Casserole, and Barbecued Turkey Burgers for simple suppers. When their friends are sleeping over, treat your teens to Sweet Treat Cookie Sandwiches or a Peanut Butter Pie. 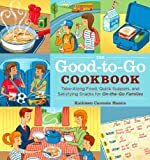 With The Good-to-Go Cookbook in the kitchen it’s possible to feed the entire family quickly and well and still arrive at every track meet and ballet recital on time. Never again sacrifice delicious, healthy meals when time is short: Here are more than 150 recipes that can be cooked in 30 to 40 minutes or less. Healthy in a Hurry offers the ultimate answer to the perennial weeknight question of “What’s for dinner?” With hundreds of quick and flavorful main-course recipes, it promises to become an everyday cooking tool for those who want to get a healthy, delicious meal on the table both swiftly and simply. Third Printing 2003 by Oxmoor House Inc. In a world that makes ever-increasing demands on people`s time, Superfast Suppers is indeed a lifesaver. Innovative recipes with carefully calculated ingredients (never more than 10), and attenuated prep times (not longer than 20 minutes), get cooks in and out of the kitchen in record time to put delicious meals on the table. Clever and always quick, Superfast Suppers will revolutionize your cooking with no loss of nutrition and no compromise in taste. Especially notable are the 20 recipes with less than 10 minutes of prep time, the 10 slow-cooker dinners and the 25 `Deadline Desserts` which require only 15 minutes from beginning to `yum!` Finally, this book boasts the unique `Have It Your Way` chapter that lets everyone create their own special meal from one basic item and a plethora of toppings. Any way you slice it, Superfast Suppers is a must-have for today`s families on the go.